This morning when I woke up I saw that no snow had fallen overnight. Despite weather warnings for Thursday, Friday, and Saturday, no appreciable amount of snow had fallen in any of those days. How wrong those forecasts were I thought! I had to drive to get some lunch and as luck would have it as soon as I got downstairs to my car, I saw the first few flakes of snow falling from the sky. It was as if nature heard my mocking and now wanted to show me the snow. I didn’t really think it was going to amount to anything however. The flakes coming down were small, light, and weren’t sticking to the ground. As I drove the ten minutes to lunch, my unease began to grow slightly as the snow picked up a bit. At the restaurant, I had a clear view of the street during lunch and the intensity of the snow ramped up considerably while I ate. The flakes were now huge, in great numbers, and the snow stuck to the ground. It was a bonafide snow storm. I wasted no time in finishing my meal, paying, and getting the hell of out there. Others must have had the same idea because there was quite a line to pay. Once outside, I saw a sizeable blanket of snow on my windshield. It had accumulated in less than an hour. My wipers were barely able to remove the snow and I really should have used a brush but I wanted to get out of there quick! By now the roads were getting bad by the minute. At a few intersections, I could feel my car sliding a tiny bit. I breathed a sigh of relief once I was able to get my car back into the parking garage. 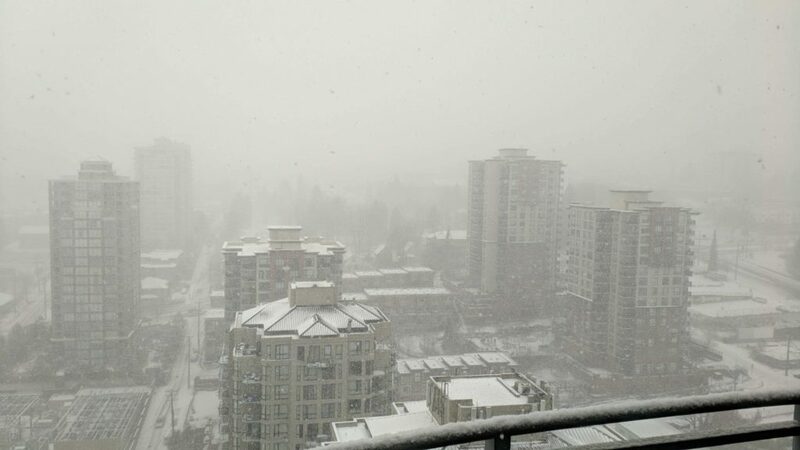 I spent the next several hours watching the snow continuously come down and just cover the entire city in a thick layer of white. I cancelled a dinner with my parents because it was so cold and roads were terrible. I’m not sure if it’ll be a snow day tomorrow but it’s definitely a non-zero chance.